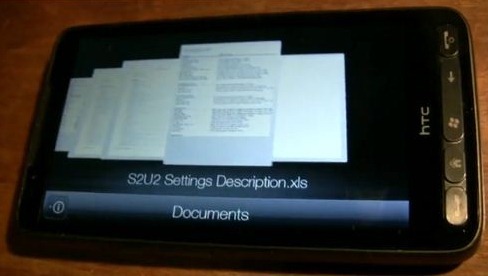 HDBlog.it has posted a hands on video which shows off the new HTC Sense 2.5.1921 in action on the new US version of HTC HD2 2.01 ROM. This latest Build of HTC Sense (aka Manila and TouchFLO 3D) brings a new “Documents Tab” which lets you quickly browse through your documents stored anywhere on your device right from the beautiful Sense interface. The best thing about this add-in is that it supports almost all popular major formats like .txt, .doc, .docx, .xls and .pdf. Holding the device horizontally will enable you to browse through documents in a 3D Cover Flow –like mode. Also shown in the video is the improved functionality in Music tab where you can see all the songs from an artist by tapping on the artist on the same page, instead of having to switch between pages.